We’ve already mentioned this: knowing your customers is the key to successful and effective advertising. Assuming that you have already passed this step we’ll take a look in building the right target audience on Facebook. Facebook targeting options are probably the greatest advantage that Facebook has among all advertising platforms. Of course, you can just throw a campaign to all users of Facebook in attempts to reach to more potential customers but it’s proven that this strategy doesn’t work the way most people think. Think about the ROI of such a campaign – you’ll spend a bag of money and the result wouldn’t even pay for its own budget. The reason? Targeting irrelevant people just for the sake of “finding hidden gems” doesn’t pay off much. That’s why you need to narrow your Facebook audience as much as possible. You know who’s interested in what you have to sell, you know who your customers are. 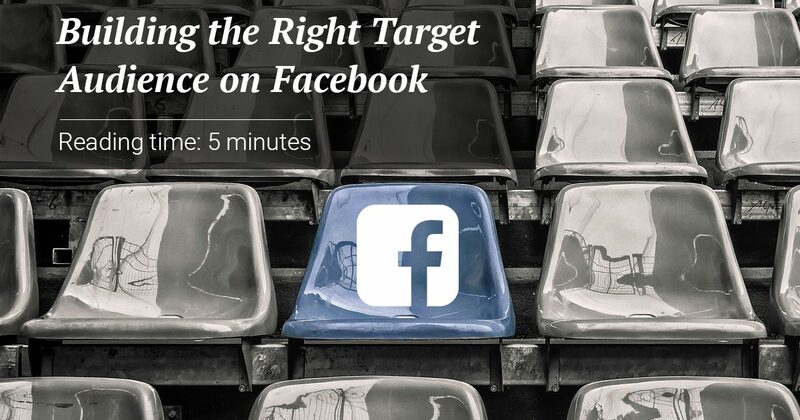 Use Facebook’s awesome targeting options to find exactly who you need and reach out to them. You don’t need the rest of the world. They wouldn’t buy anyway. You can create those when setting up a campaign or in the Audience manager. This type of audience can be defined by age, gender, interests, devices, location and so on. What geographic areas does your business serve? A city? A specific area of the city? Or the entire country? Facebook helps you narrow down even to a specific post codes/ zip codes. Moreover, you can choose if you want to reach to people living in the specific area, traveling to this area or recently been there, or everyone in it. Is your product or service suitable for both men and women? Or just men? Maybe above the age of 25? Married? With a Master’s degree in science? Facebook allows you to find exactly what you need. You can easily target by education, occupation, relationship status, even by job title. This might be the easiest option. You know what you sell and Facebook gives you the option to choose to target those who are specifically interested in your business field. Your ideal customer is a mobile addict? Well, here you can find the option to target those who browse Facebook mainly on their smartphones. But it doesn’t end there. You can target Facebook page admins, small business owners, frequent travelers, or by their purchase behavior. The main advantage of excluding audiences is to prevent your ads to be shown to people who have recently purchased your product or service I.e recent converters. You can save that audience and include it later in the initial campaign or another campaign for upsell. Depending on the goals you’re after with every campaign, you can create a few different Saved audiences to choose from. This way your rotating campaigns will always target the perfect audiences without wasting time in setting everything up again. You collect information on your customers, right? Their e-mails, names, phone numbers, app ID’s. You can utilize those lists and use them in Facebook to find and reach out your customers. You can do that by uploading a file or use the option to import third party email service. After you’ve provided the data to Facebook, it’s used to match and find who you want to show your ads to. You can also choose which identifiers to use for matching: being e-mail, first name, city, or Facebook page, user ID (if you have it), and more. This one requires to use a Facebook Pixel on your website, so the platform can track who and how interacts with it. It’s the perfect re-targeting tool as you will reach to people who have already showed some interest on what you have to offer and visited your website. The options of narrowing the target audience include everyone who visited the website, those who visited specific pages, and visitors by time spent. “Create a custom audience to reach people who take specific actions in your app – like reaching a specific level in a game, adding items to their cart or rating your app. A new feature which allows you to measure the effect of Facebook ads to in-store purchases i.e. how many people bought your products from your physical store after seeing your ad on Facebook. Now you can track the effectiveness of your Facebook ads more precisely. This option helps you to create a list of people who engaged with the content. Engagement is connected with any type of interaction with content, including: mouse over, clicks anywhere on content, looking at the content for several seconds, shares, likes (or hates), comments, clicks on CTA buttons on Ads or Facebook Pages and posts. It has a few extra options to narrow the target audience further such as those who spent time to watch your videos, opened your collection ad or Canvas, interacted with your Facebook page or with your Instagram business profile, including a new option of creating a list of people who have interacted with your events. 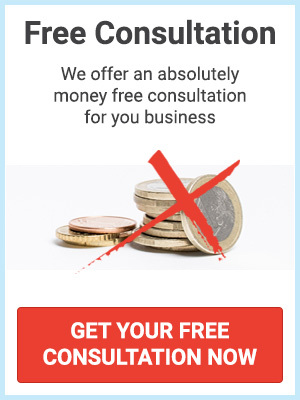 Of course, you have even more options to narrow further such as targeting everyone who visited your page, or just people who clicked on the call-to-action button and so on. As the name suggests this option allows you to find those who are similar to your existing base of target audiences. 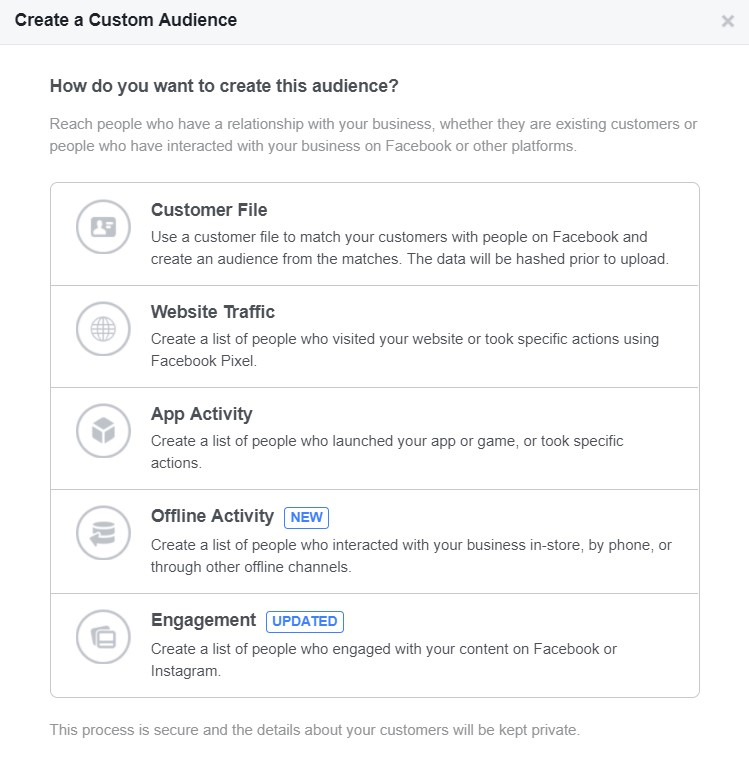 To be able to create such you’ll first need to give Facebook some information about your customers using the Custom Audience feature. Then you will get the option to reach more potential customers who have something in common with your current client database which may eventually lead to increase in sales. As you see, Facebook provides with everything you need to find and reach your perfect audience depending on yourmarketing goals. Of course, you don’t have to use every single option you see but only those you need so your campaigns can generate the best ROI. Juggle with everything you have and find your business’ sweet spot. If you need assistance for managing your ads on Facebook, our dedicated experts in social advertising will help you. Contact us here in the live chat or write to us any time at contact@mokeez.com.